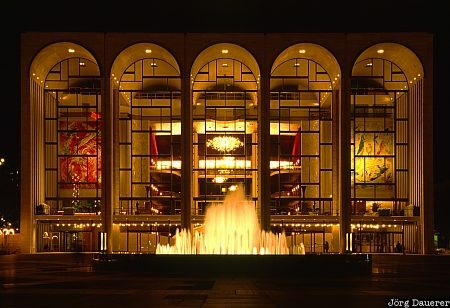 The floodlit Metropolitan Opera House ("The Met") and the fountain in front of it, all part of the Lincoln Center on the lower west side of Central Park in Manhattan. Manhattan is the center of New York City in the state of New York at the east coast of the United States. This photo was taken in the evening of a sunny day in November 1997.